In-situ measurements in clouds provide several microphysical parameters which describe cloud structure and properties. 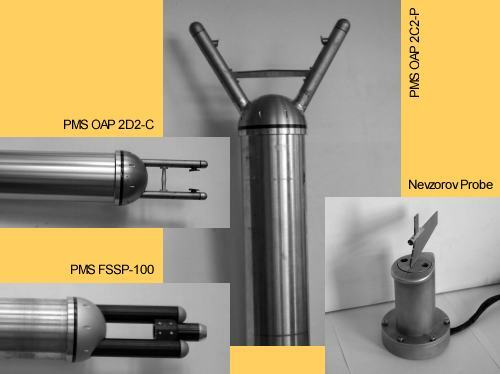 While the PMS probes are used to measure particle concentration and size distribution, the Nevzorov probe measures the liquid and total water content. Both can be carried by several aircraft. The FSSP measures the forward scattered light produced by a cloud particle passing through a laser beam (He-Ne, 632.8 nm) inside the sample volume. Particles are counted and the intensity of scattered light is a direct measure of their size (e.g. van de Hulst, H.C., Light scattering by small particles, Dover Publications, Inc., New York, 1981). If particles pass the laser beam (He-Ne, 632.8 nm) of the OAPs inside the sample volume of the probe they shadow a line of 32 detection diodes. The shadow images are used to count the particles and to determine their size. The Nevzorov probe is a so-called hot-wire device. Two resistors are heated to evaporate all particles that touch their surface during the flight. Due to their shape they are able to catch small droplets or droplets and ice crystals. The amount of energy necessary to evaporate particles is a direct measure of the liquid water content (rectangular sensor) and the total water content (cone), respectively. Investigation of the influence of the calibration method on the data quality.